A SOUTH Belfast businessman has lambasted restrictive City Hall regulations on the restoration of listed buildings. Anthony Kieran, founder and director of UsedcarsNI.com, purchased a property in South Belfast’s Upper Crescent area in 2015 with a view to making it into his company’s new office. However since then Mr Kieran says he has faced nothing but red tape and bureaucracy. Mr Kieran said: “Upper Crescent is unlike anywhere else in Belfast, the buildings are constructed in the Regency period and are very grand, it is easy to see why they are listed. After he purchased the property in Upper Crescent, Mr Kieran got in touch with all the relevant agencies to ensure that things ran smoothly. He said: “We applied for and received Listed Building Consent, Planning Permission and Building Control Approval. We put in place a very experienced architect and builder to oversee all works and our building work began in earnest in October 2016. While this work was being undertaken Mr Kieran received a call from the Enforcement Office within Belfast City Council informing him that a report had been received stating that work was being carried out without proper planning permission. The Council requested that they be provided with a written undertaking that this was not the case and Mr Kieran informed that an inspection would need to be carried out on the property. Mr Kieran was later informed that he was in breach of planning permission and all works must cease immediately. As a result of this the project has now been put on hold for six months, with the property being broken into and equipment being taken as well as damage being done to the property. 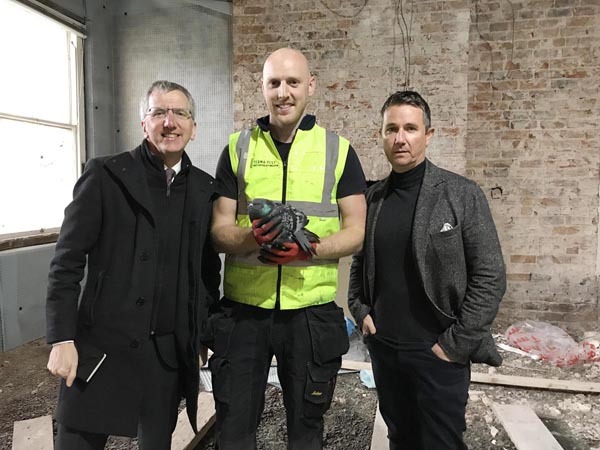 South Belfast MLA Máirtín Ó Muilleoir said: “This is a £1m investment which would transform a derelict property and help return to its glory days one of Belfast’s finest streets. All of us want to defend and protect our built heritage but after allowing this building to fall into rack and ruin over a 20-year period, it’s vital that the Council gives this restoration work the go-ahead. Maria O’Loan from Tughans Solicitors, who are representing Mr Kieran, said: “It’s very disappointing that there have been so many delays in dealing with this matter, this is directly contributing to the deterioration of an important listed building that has been neglected for many years.